Olympian Chelsea Marshall is a Pittsfield, Vt., native who learned to ski at Killington at an early age thanks to her parents being ski instructors. She trained at the Green Mountain Valley School, a race academy in Fayston, Vt. with alpine training facilities at Sugarbush. Her mom Barbara home-schooled Chelsea, Cody and Jesse Marshall. At age 16, Chelsea Marshall joined the U.S. Ski Team Development Team (2002) as a “rookie.” She first raced as a technical skier (Slalom and Giant Slalom disciplines) on the Nor Am and Europa Cup circuits but worked her way into the speed skier disciplines (Downhill and Super G) winning the 2007 NorAm Super Combined championship. She rose to the USST top level women’s alpine team and raced her first Super G World Cup in December, 2006. She captured top-10 World Cup finishes, mostly in downhill. She also took a number of National podiums in Super G and Downhill. In 2010 she raced Super G at the Vancouver Olympics. After a decade of competing as a member of the U.S. Ski Team, Marshall retired after tearing ligaments in her knee and fracturing her scapula at a World Cup downhill training run at Cortina, Italy. Wanting to share her passion for the sport and use her experience to inspire others, Marshall began working at the Killington Mountain School as an instructor and coach for girls ages 12-19 in 2013. The Mountain Times asked Marshall to share her perspective on racing and the World Cup. Mountain Times: What was it like racing at the World Cup level? Chelsea Marshall: The energy, the excitement and adrenaline that come from being a competitive speed skier is incomparable. I enjoyed being on the road, traveling to new places and competing all over the world. MT: What caused you to compete? CM: I loved the competitive side of the sport and was told I had a touch for the snow. I grew up chasing my two older brothers around the mountain. I was always up for a challenge and took pride in beating the boys. I was fearless on a pair of skis and could not go fast enough. I started racing Nastar at Pico Mountain when I was really young and from there I was put on a race team at Killlington Ski Club. MT: Could you explain how your growing up locally affected you? CM: I grew up in Pittsfield and had Killington Mountain in my backyard. I would get picked up from KES [Killington Elementary School] and would ski for the last hour of the day. I spent a lot of time free skiing in every condition and developed a feeling, along with a touch for the snow. MT: You mentioned pushing yourself; what role does drive play in competing? CM: Drive gives an athlete a competitive edge. You can be best friends with your teammates off the hill but on the hill, a competitor. The challenge for a coach is to bring it out in a kid. MT: How do you bring that drive out in your student-athletes? CM: As a coach, I want to share my passion for the outdoors, my love of being on the mountain and my enthusiasm for being on snow with my athletes. I try to push my girls and give them the tools they need to excel on any level. I’m open to sharing my experiences of being on the World Cup with young athletes. MT: Will you be attending the World Cup with your students? CM: We will be there in full force cheering on the World Cup athletes. KMS athletes will be busy slipping the course, walking in the opening parade and forerunning. I’m excited to have best friend, Megan McJames, competing. We will be busy pie baking in prep for her World Cup race. MT: How are seeing World Cup events important for students/young athletes? CM: Our athletes have been looking up to these girls for so many years and to have them at your home mountain is unique. They can learn from their level of professionalism and dedication to the sport. Their dreams can be attainable and they can aspire to be on the same level one day. To be able to observe how the World Cup athletes conduct themselves on and off the hill will be a learning tool for my girls. They will benefit to see their drive and passion for the sport first hand. MT: How does Superstar compare to race courses you were on? CM: Superstar will be a challenging venue for the athletes. The girls will have to stay strong and powerful all the way to the end. The hill never really lets up. There will be no lull in action. It has a good pitch right out of the start, middle Superstar is consistent and the lower section is steep with a strong fall-away. MT: And what will the racers be looking for regarding the race course conditions? CM: The racers will be looking for a hard, grippy surface that will hold up throughout the race. MT: Will any KMS students be in the opening parade? CM: Our KMS athletes will be in the opening parade and look forward to welcoming everyone to Killington. MT: Wow, what a memory to have. Besides the competitions, what are some of your memories? CM: Traveling the world was one of the great rewards of competing. I wouldn’t have had that opportunity otherwise. MT: Will you be doing youth race clinics again this year at Killington? CM: Yes, I do several introductory weekend race clinics for youngsters 8-12. I like working with youngsters and introducing them to gates. I stress an easy-going environment and fun. I was inspired by nurturing and dedicated coaches and enjoy being part of that process today at KMS and Killington. 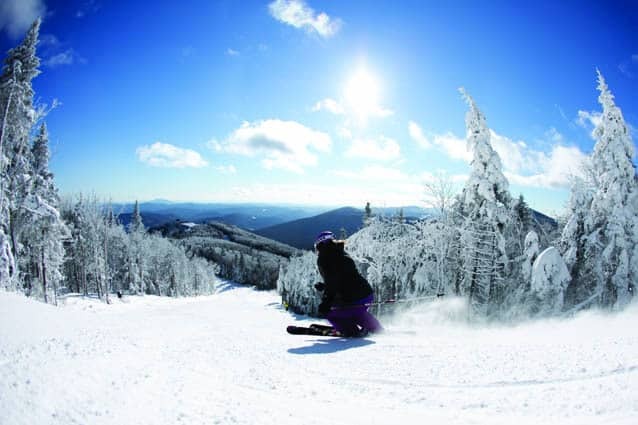 Chelsea Marshall carves down Killington on a bluebird day. Marshall, originally from Pittsfield, Vt., was a U.S. Ski Team member and past Olympian. She is now a coach.